A few weeks ago a friend emailed and asked if I would make a quilt for his wife and soon-to-be-born baby boy. We have known them since my husband was in law school and they have been living in Hong Kong for the past several years and they are some of my favorite people in the whole world. Now that they have received the quilt and the baby has been born, I can post the finished product. 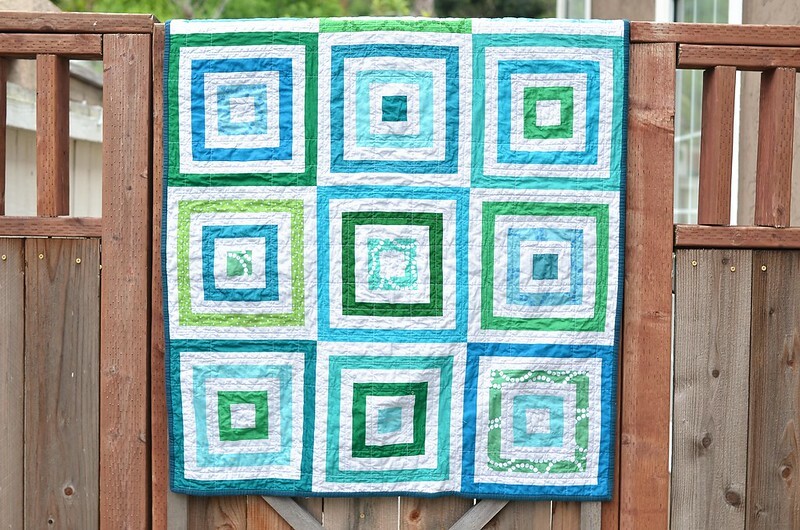 I decided to do a log cabin quilt with lots of blues and greens. The fabrics are mostly solids, with a few of Lizzy House's Pearl Bracelets prints mixed in because they are just the best colors. Plus they coordinated with the Natural History print that I used on the back. 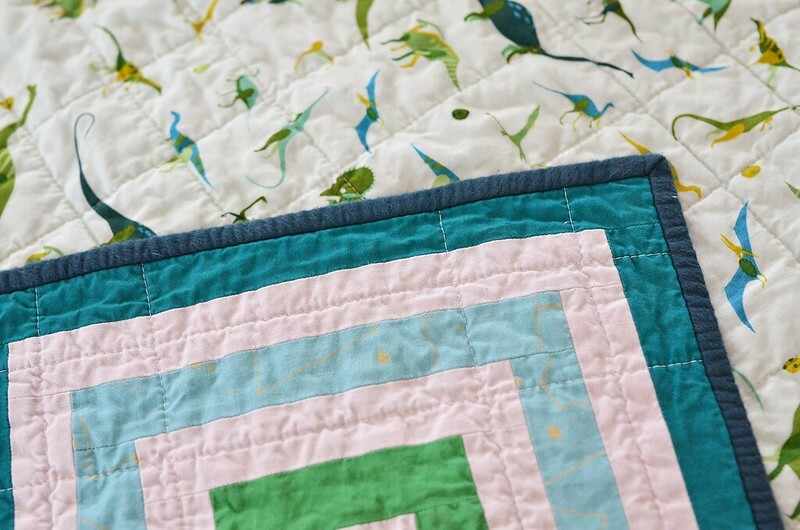 I love this gorgeous dinosaur print and I used the colors as inspiration for the quilt top. I did something a little different for this quilt; I used double gauze as the binding. This idea really started because it was the only fabric that I had that was the exact color that I wanted for the binding, but it ended being (I think) a great, soft way to finish off a quilt for a brand new baby. For the batting I decided to use bamboo, since it drapes really nicely and I thought that all of the seams in the quilt might make it a little stiff. I love how the bamboo turned out! So soft. I normally photograph quilts before washing them, but my dog had other plans and there was a dog print that needed to be removed from this quilt before it was gifted. (Oops! Sorry Richard and Betsey!) Luckily the dog print came out in the wash. Finished size: 36" x 45"
Great quilt! I love the colors and the backing. This design is so interesting! Not to mention these are some of my favorite colors.. :) I like how some of the blocks start with a color center and others with a white one. This is such a fun baby quilt that doesn't scream baby. Great quilt! I love the design. I wouldn't have thought of doing a log cabin quilt that way. Just sad I can't work out how to pin it to Pinterest, too many quilts on the go at the moment to start another one. Great quilt, it looks so cozy! Great way to use the log cabin block, but even better is your choice of fabrics. That backing is boyish but fun and the front coordinates beautifully. 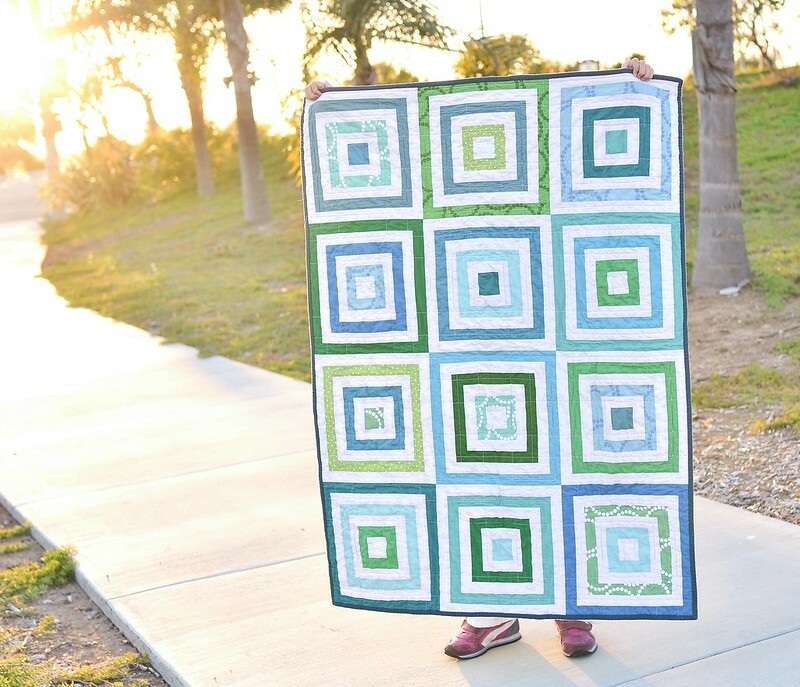 Your friends' little boy is going to have a blast cuddling with this quilt! Ideal for a little boy - those colours are lovely and the dinosaurs on the back are really cool - great work! Really structured and useful information. And everything is clear, thanks. I looked through some posts and must say, they are very interesting. http://awriter.org/iwriteessays-com-review/ Best regards, essay writer.